"The Autobiography: From Deep Purple To Black Country Communion,” by legendary rocker Glenn Hughes is now available in paperback. A limited-edition hardback version of the book was published in May via Foruli Publications under the title "Deep Purple And Beyond: Scenes From The Life Of A Rock Star." The book was co-written with Joel McIver and features an introduction by Metallica's Lars Ulrich. You can preview some of the book here. 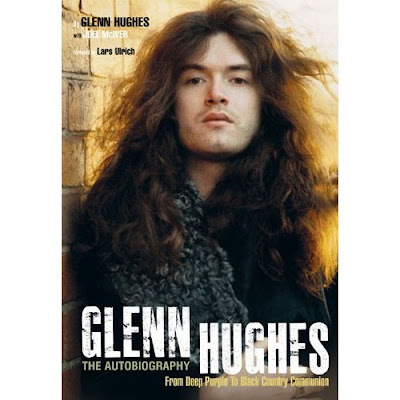 Glenn Hughes’ years in Deep Purple epitomized the glamour and excess of 1970s stadium rock. Playing in one of the world's biggest bands, recording classic albums such as “Burn,” squiring a long line of film starlets and singers, ploughing through a mountain of cocaine and hanging out with a multitude of stars including David Bowie and the Rolling Stones, Hughes lived a life that many can only dream of. However, it soon metamorphosed into a nightmare. Glenn's journey through cocaine and crack addiction was a trip few people would never have survived. And after the demise of Deep Purple and disastrous stints with Gary Moore and Black Sabbath, Hughes hit rock bottom. But the book is billed as a story of redemption. Glenn came back from the gutter a new man and went about reclaiming his position as “The Voice of Rock” - first with the KLF and then as a solo musician with an international fan base, before teaming up this past year with Joe Bonamassa and Jason Bonham in Black Country Communion. Last month, Black Country Communion released their first concert DVD, "Live Over Europe"; the Blu-ray edition comes out November 15.